I’ve never been much of a Post-It note type, but I have gone through many Moleskine notebooks to jot down notes and ideas. And while I still enjoy pencil and paper for quick brainstorming or design concepting, they aren’t great for staying organized. Paging through a notebook to find some bit of information is a real pain. These are the obvious reasons to use a note taking application. Organizing things into separate notebooks, and the ability to tag notes makes things easy to locate and keep tidy. 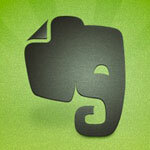 One of the great things about Evernote is that it’s web-based (cloud-based if your cool). This means I can take a note on my iMac, and it will show up everywhere – my laptop, iPad, and phone – and vice versa. There’s also browser extensions for saving web pages, although there’s better ‘read it later’ apps for that – like Instapaper. Evernote’s sharing ability is perhaps the crown jewel – You can share a notebook with a single person, or publish it to the world (here’s a link to a new WordPress Training Notebook: https://www.evernote.com/pub/spigotdesign/wordpress). You can easily stop sharing any time too. Do you use a note taking app? If so let us know below in the comments. And feel free to share any note taking tips you may have!